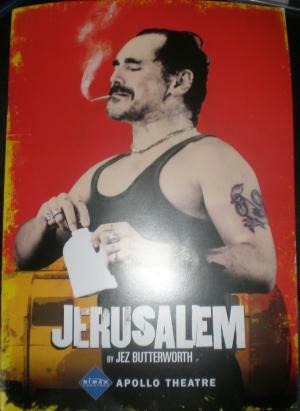 We went to see Jez Butterworth’s play Jerusalem in that London yesterday. As has been already noted, it’s a fine production of a wonderfully messy play. Do go and see it if you can (it’s sold out for the current run). Mark Rylance heads up a company that revels in the revels. The audience (even in our restricted view area) were rapt for the whole three hours. It gives you faith in theatre again. We decided that Rooster Byron would fit in very well in Hastings. Every third bloke there is a pirate, a shaman, a storyteller and/or a dealer. The play has set me of on a new line of research for next year’s character at Bodiam. I’ve ordered some books on English folk tales and folklore. That London was a bit disappointing. There are very few Christmas decorations and the place felt a bit grim. Buck Palace is illuminated, but only up to the levels of an East European railway terminus. Perhaps it’s a theme. Posted on December 22, 2011, in Bodiam Castle, Hastings, Storytelling, theatre. Bookmark the permalink. Leave a comment.